In the advent of BabyMetal, the Japanese idol scene has gotten more interesting with more eyes and ears being opened from the East to the West. BabyMetal has been welcomed by American metal fans with open arms and created a stage for themselves to stand out on their own. In the Japanese Idol scene it is important to stand out especially since you are competing with thousands of other Idols for the same fans. And some of them are with an agency and some of them are on their own. 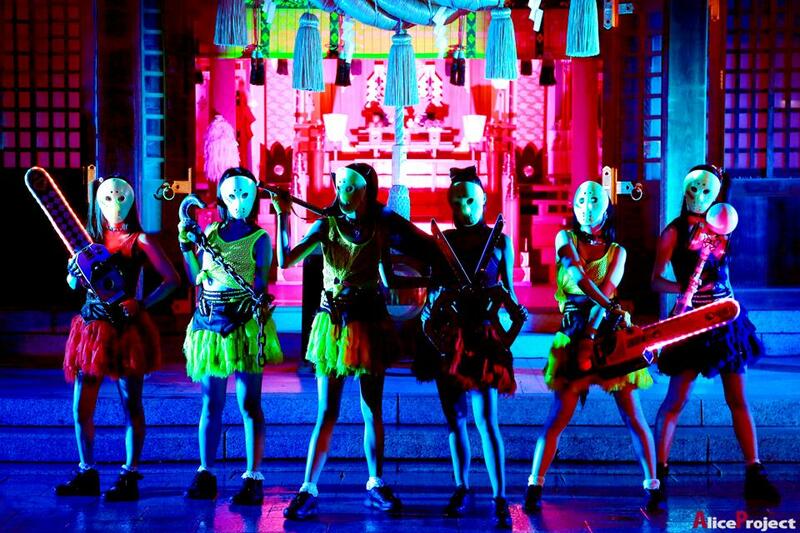 In 2013 one group decided to ditch the cute and glamour and go for a horror theme gimmick with bright colors. 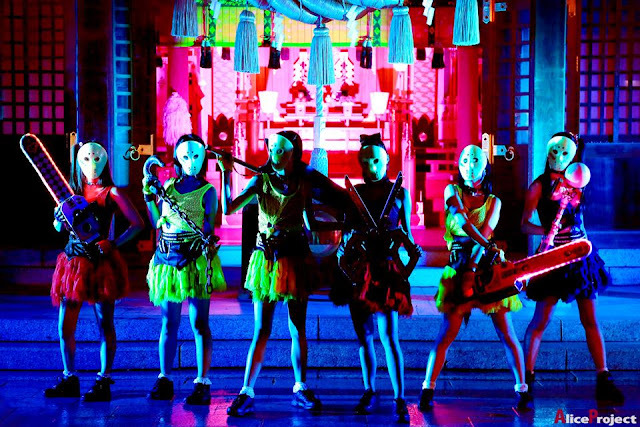 Kamen Joshi, “Masked Girls” in Japanese, went into a direction that can best be described as horrifyingly cute. While most Idols regard their face as a selling point, Kamen Joshi intentionally hides theirs to make a bigger impact on the audience. “We gave up on cuteness and instead we rock hard, using the power that comes from the bottom of our hearts to do our live performances” explains Moa Tsukino of Armor Girls. Nanaka Kawamura of Alice Juban also adds “Kamen Joshi is a group made up of people who failed the audition for other major idol agencies. Since we can’t get by on our looks, we became a group, and wore masks. We also wear masks because we need to fight together as a mass of people, rather than as individuals”. I first heard of them through an article on CrunchyRoll and once I saw the masks I just had to know more about them and see what they were about. I like that the masks are reminiscent of Friday the 13th’s Jason Voorhees, I wondered if the masks would be customized to become a reflection of each individual member. According to Ikeda Kohei (PR for Kamen Joshi), “They stay uniform, but one person has a red mask to be positioned as the center”. Also I should add that the girls are not horror fans themselves. After seeing some concert footage I was glad I took the time to check them out. The concerts where they are fully masked remind you that this is not a typical Idol group. Going from a seemingly pop tempo to heavy metal like a flick of a switch, really brings out the true power of the masks. Although they are masked, there is a true sense of unity with their fans. Managed by the Alice Project a Japanese agency that houses the group and other “Underground Idols”; the band performs in the Akihabara district at the P.A.R.M.S Theater inside the Pasela building. Alice Project describes the girls as: “the "non chosen person” and have no place in entertainment industry so gathered and obtained strong identity as a group besides abandoning personal identity by wearing the mask and hiding their face”. 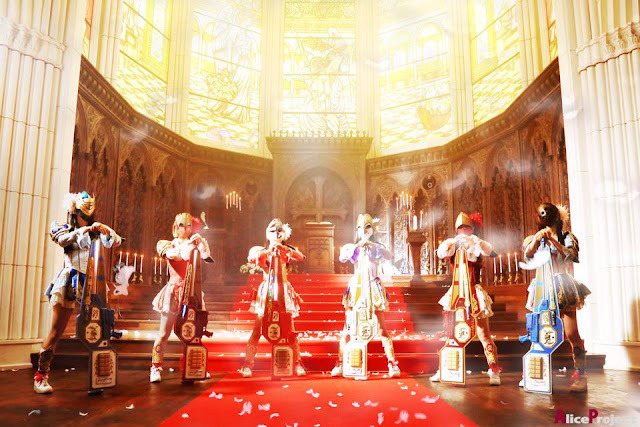 Last year their first single "Genkidane", hit the top of the weekly Oricon ranking charts with more than 200,000 records sold in the first week of release, setting a record for a female indie band in Japan. When asked about how it felt to set that record Ikeda Kohei (PR) had this to say: “The moment was the most happiest moment for the first time our life, the 2nd is the day we accomplished our live concerts to mobilize 15,000 people”. To make it to number one with a gimmick that has their Idols wearing masks is a big accomplishment because it shows they are not just getting attention from the Otaku fan base but from average music fans as well. So it puts more emphasis on the music and performances rather than their looks. Alice Juban was the first of the Kamen Joshi groups to be formed. Alice Juban's music often includes metal breakdowns and rap sections. All members wear Jason-style hockey masks and wield a selection of prop weapons ranging from chainsaws to giant scissors. 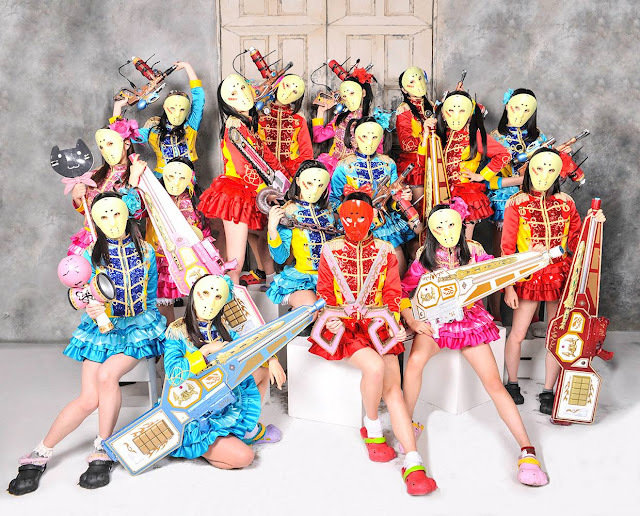 Members include: Anna Tachibana, Nodoka Sakura, Kanon Mori, Nanaka Kawamura, Yuki Sakura, and Risa Sawada. Steam Girls was formed as Alice Juban's official sister and rival group. Though their first song "destiny" was a pop-rock number, since the release of "HIGH and LOW" in 2013 their music has come to incorporate more sounds from electronic and dance music. 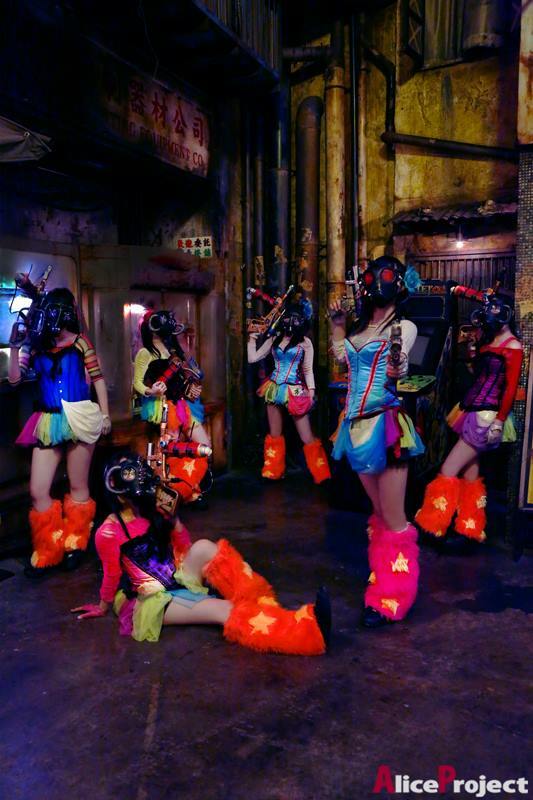 The members wear gas masks and leg warmers in a style combining elements from SteamPunk and CyberGoth fashion. On stage, they carry distinctive prop guns that fire laser beams and clouds of dry ice together, creating a vivid on-stage effect. Members include: Sara Kurose, Erina Kamiya, Mai Mizusawa, Mana Sakamoto, Yuuka Kojima, and Ume Koume. 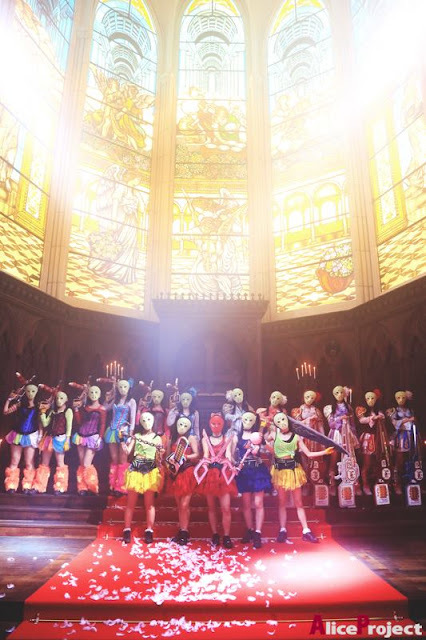 Armor Girls was formed after Alice Juban and Steam Girls had already released two singles as Kamen Joshi, making them the most recent addition to the group. Their masks are medieval armour helmets with visors, and they carry prop swords. Musically, Armor Girls' songs incorporate elements from Irish and Celtic folk music, leading to a unique sound they call "mori rock", or "forest rock". Members include: Hinako Kuroki, Misa Kubota, Moa Tsukino, Mayu Kusunoki, Hitomi Momose, and Maki Kitamura. I also asked Ikeda Kohei about their upcoming tours; they have begun touring in parts of Asia such as Singapore in February, China in March and Vietnam next week (from the date this article was posted). And if they have fans in Europe and America they will gladly make the trip overseas. “We have strong desire to go to US. We love Americans; they have great kindness and strong power. We have a strong desire to go to US, please help us come to America”. Recently the band made a video that jokingly showed their support of Presidential Candidate Donald Trump; “We produced the movie tribute to Donald John Trump, but there are no political intentions, just a joke”. It just goes to show that the world is paying attention to the United States and that Donald Drumpf is a joke all over the world.